On Thursday, self-described investigative journalist and activist Laura Loomer handcuffed herself to Twitter's New York City headquarters to protest the company's inconsistently applied "hate speech" policy and their recent ban of her account. "I threw away the key, and I’m here for the millions of conservatives who have been censored by [Twitter CEO] Jack Dorsey and [Facebook CEO] Mark Zuckerberg," Loomer said during the demonstration. The 25-year-old was banned from Twitter last week over a tweet which criticized Rep.-elect Ilhan Omar (D-MN) and Islamic practices like female genital mutilation (FGM). "Isn't it ironic how the twitter moment used to celebrate 'women, LGBTQ, and minorities' is a picture of Ilhan Omar? Ilhan is pro-Sharia Ilhan is pro FGM. Under Sharia homosexuals are oppressed and killed. Women are abused and forced to wear the hijab. Ilhan is anti-Jewish," she wrote. Loomer was standing beneath a homemade poster which featured side-by-side Twitter screenshots of the tweet that earned her the ban and a blatantly anti-Semitic tweet from Louis Farrakhan, who still has an account. "Loomer blew up Louis Farrakhan's tweet calling Jews 'termites' and showed it side-by-side next to the tweet that she was banned over where she called out Democrat Ilhan Omar for being pro-Sharia law and then listed off how Sharia law targets women and the LGBT community," reported The Daily Wire's Ryan Saavedra. Farrakhan's "termite" tweet is still on Twitter. 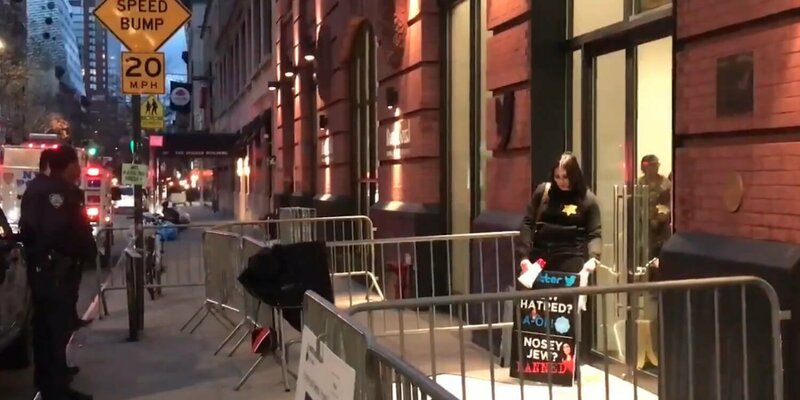 Loomer was holding a sign that linked Farrakhan to Jew-hatred and described herself as a "nosey Jew." Officers on scene reportedly said they would not arrest Loomer since Twitter would not be pressing charges against her. They also told the activist that they would cut off her handcuffs if she asked them to. A Twitter spokesperson told Saavedra about Loomer, "We have notified the relevant authorities who are responding. The account holder was suspended for violating our policies. We apply the Twitter Rules impartially and not based on ideology." Loomer, however, ended the protest around 6:20 p.m. local time. Her account is still banned.